Édouard Manet, the most Parisian of the Impressionists, always lived and worked in the Quarter d’Europe during the decade of 1860. His apartments and studios were registered in the west and south of Paris near the Place de L’Europe and the Gare Saint- Lazare. 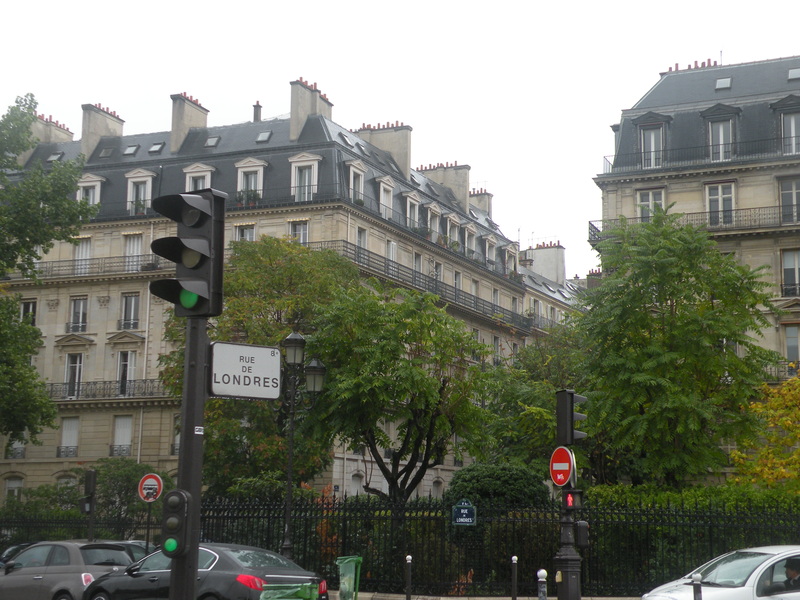 The gardens of his apartment near the Gare Saint-Lazare where he painted Le Chemin de fer can still be visited today. As you stand near the rod iron fence, you can watch the smoke rising from the trains as simulated in Manet’s painting. Manet passed through these streets each day and knew every inch of its territory, its colors, shades, sounds, smells, the distinctive styles of the new Haussmannien quarters towards Montmartre. In 1872, Manet’s Le Chemin de fer (Kimbell, Ft. Worth, Tx) was a key work of art. 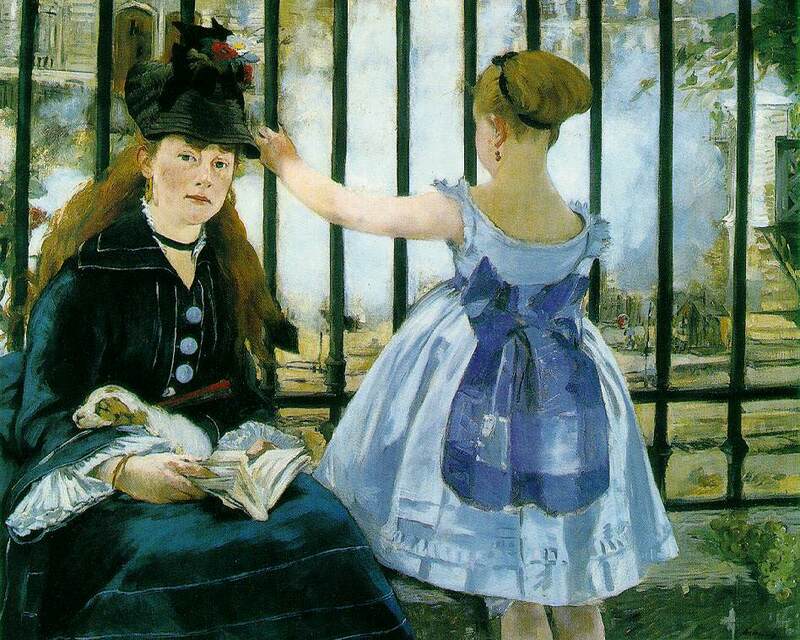 It was the first great composition which showed Parisian life after the war of 1870 and the Commune. In this painting, Victorine Meurent, his favorite model and who is depicted in both Le Dejeuner sur l’herbe et Olympia, is presented here as herself, clothed in business attire, a little girl by her side, and, on her knees, a little choit beagle. The little girl is looking through the fence at le Gare which is hidden by the smoke coming from the locomotives, representing the modernity of industrialization of the new Paris. Manet was not alone in his painting the new Gare Saint-Lazare. His friends and fellow painters Claude Monet and Gustave Caillebotte also lived and had studios near the Place de L’Europe and painted this new Paris. Even though their styles are diversely different, the main themes of painting real life, en plein air, and modernity, can be seen in all their works. Monet and Caillebotte would later exhibit their works of the Gare independently of the Salon which allowed the world to judge art for themselves; for the first time. I will review these paintings in subsequent posts. Wilson-Bareau, J. (1998) Manet, Monet: La gare Saint-Lazare.Yale University Press. I’m very interested in seeing the garden from this painting! Is it open to the public or is there someone to contact? I wasn’t able to go inside the gardens; I only stood outside the rod-ironed fence from the vantage point behind the girls in the painting; facing the Saint-Lazare. I researched this on Google but did not find the answer to your question. I will continue the search as I am intrigued as well!